MANILA, Philippines -- She was hailed as the greatest Filipino woman painter today, whose rare exhibitions were always awaited in art circles. Last Friday, Anita Magsaysay-Ho, 97, died much the same way she lived her life: peacefully, humbly, gently. A genteel lady raised amid great culture and wealth, Anita was married to shipping magnate Robert Ho of Hong Kong. In 1999, she set a record high for a living Filipino artist when her work “In the Marketplace” was sold for the equivalent of P15 million at Christie’s Singapore. Her art was totally Filipino in inspiration, quite ironic for an artist who moved homes a total of 45 times as she and her husband established residence in Hong Kong, Washington D.C., Sao Paolo, Tokyo, Vancouver, Montreal and Manila. The imagery of Anita’s art obviously came from the rustic barrios of Zambales where she reveled in summer sojourns. The Magsaysays come from the 19th century mestizo-principalia class of Zambales. Her mother, Amalia Leonor Corpus, was born in San Antonio, while her father Ambrosio Magsaysay hailed from San Marcelino. (Anita’s uncle, Exequiel, was the father of President Ramon Magsaysay). Anita was born on May 25, 1914 in the Paco mansion of her grand uncle Don Fernando Teodoro Rafael Yangco, a shipping tycoon and philanthropist who served as the Philippine Resident Commissioner in Washington D.C.
She attended the UP School of Fine Arts at the age of 13, accompanied by a nanny. Among her schoolmates were Botong Francisco, Vicente Manansala, Galo Ocampo and Cesar Legaspi. The school head, Fabian de la Rosa, suggested that Anita pursue art studies in Europe. 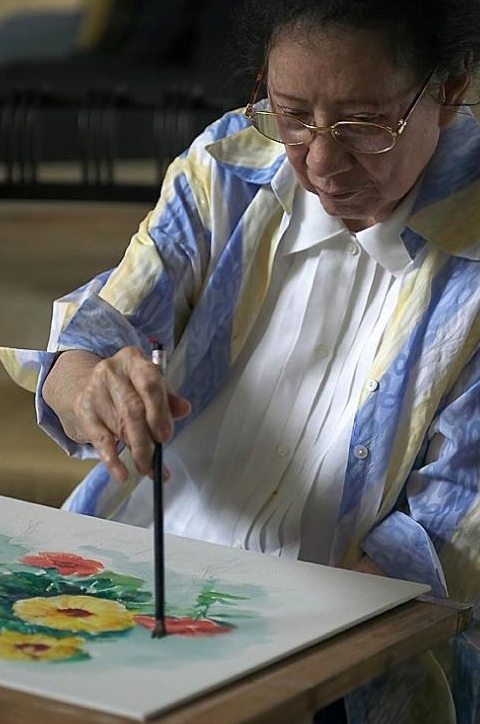 Her landscape teacher was Fernando Amorsolo, but she learned drawing from the maestro’s brother Pablo Amorsolo. The socially sheltered Anita also had a private tutor, Ireneo Miranda, the leading political cartoonist of the era. Labeled as “the female Amorsolo,” Anita was hailed as both conservative and modernistic in her style. The young artist also enrolled in the Atelier of Modern Art founded by Victorio Edades – who proudly declared himself as the avant garde in art – along with Galo Ocampo and Diosdado Lorenzo. She even worked with Edades doing murals for a mansion of President Manuel Quezon in Pasay. She was fittingly named one of the 13 Moderns in Philippine art. It was after World War II when Anita was sent by her parents to study at the Art Students League of New York, and later to the Cranbook Academy of Art. In New York, she met Robert Ho, the son of a shipping tycoon. The two fell in love and were married in 1947 and have five children – Helen (married to Robbie Delgado), Linda (married to Gage McAfee), Doris (formerly married to Jessie Maxwell), Robert Alexander and Steven (married to Jaymie Glasmann) – who gave them 14 grandchildren and five great grandchildren. Daughter Doris says her mother painted diligently from 9 a.m. to 5 p.m. till the end. Herself a gifted artist (her brother Robert likewise inherited the artistic genes), Doris and her mother spent weekends together, doing portraits of their relatives and friends. For years, they did their weekend routine – until 2009 when Anita suffered a stroke. For a while, Anita stopped talking. But one day, she called her husband and talked for one minute just to tell him: “Robert, you are the only man I ever loved in my life.” And then she never talked again. “Tita Anita is one of the sweetest and most humble persons I have ever met. Never wanting recognition, she was happy to let her paintings speak for her,” says Randy Young. Anita Magsaysay-Ho’s art speaks of an artist’s passionate love of country, deeply inspired by its women. She received countless awards in her lifetime. She was once named one of the six greatest artists of the Philippines – along with Vicente Manansala, Arturo Luz, H.R. Ocampo, Carlos V. Francisco and Fernando Zobel. Those honors – and her record-breaking sales in world galleries – spoke for this woman who spoke gently and humbly. Anita Magsaysay-Ho’s remains are at the Capilla de la Virgen of Santuario de San Antonio in Forbes Park, Makati. The wake is from noon to midnight. Masses will be held today and tomorrow at 7 p.m. The funeral Mass is on Tuesday, May 8, at 6 p.m.